Merge your love with this Exquisite Diwali Special Gourmet Basket and send warm Diwali Greetings to your dearest ones. This festive Gift Basket is filled with delightful treat for all to enjoy like Five Pc. 5 Star Chocolates, One Heart Shape Box containing 3 Handmade Chocolates, One 250 gr. pack of Haldirams Bhujia, One 250 gr. pack of Haldiram Soan Papdi, One 250 gr. pack of Haldiram Kaju Katli, One 750 ml. 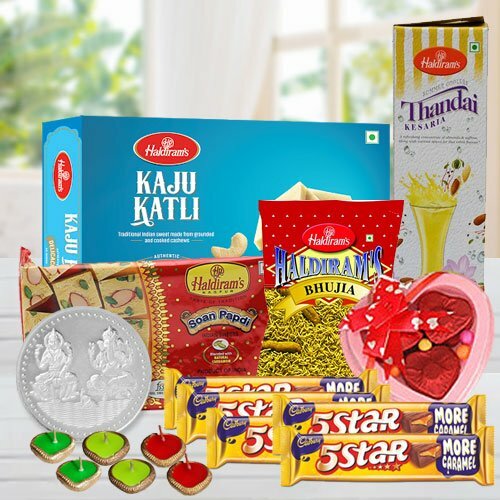 Bottle of Haldirams Thandai, Five Diyas and One Free Laxmi Ganesh Silver Plated Coin. Note: Basket design may change as per availability.